The body mass index (BMI) or Quartelet index, is a measure of relative weight based on an adult individual’s mass and height. The BMI is used as a simple method to assess how much your body weight departs from what is normal or desirable for a person of your height. It is useful to know your BMI because if your weight is greater or less than the ideal range, your health risks may increase. The higher your BMI, the higher your risk for certain diseases such as heart disease, high blood pressure, type 2 diabetes, gallstones, breathing problems, and certain cancers. BMI can be calculated using a simple BMI calculator wherein you enter your height and weight to get the result. 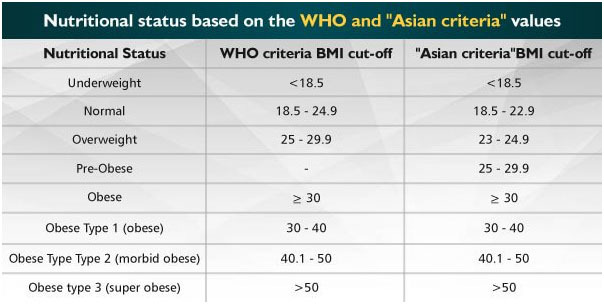 The WHO regards a BMI of less than 18.5 as underweight. This may indicate malnutrition, an eating disorder, or other health problems, while a BMI greater than 25 is considered overweight and above 30 is considered obese. The weight excess or deficiency is partly caused by body fat, but other factors such as muscularity also affect BMI significantly. Although BMI is a useful index of health risk for most men and women, it does have some limitations. BMI may not be the best indicator for risks related to obesity in certain ethnic populations, including Indians. Some individuals who look thin and have fat located around their stomach may still be at increased risk. It is important to take into account your central adiposity, measured by factors such as waist-hip circumference ratio. Therefore it is wiser to consult your doctor for proper interpretation of your BMI.